Graffiti discovered Thursday morning on the Church of Christ auxiliary building, one of three places where vandalism occurred recently. Police are investigating three incidents of graffiti that appeared in Durango. The Durango Police Department responded to two reports of graffiti on buildings early Thursday morning. 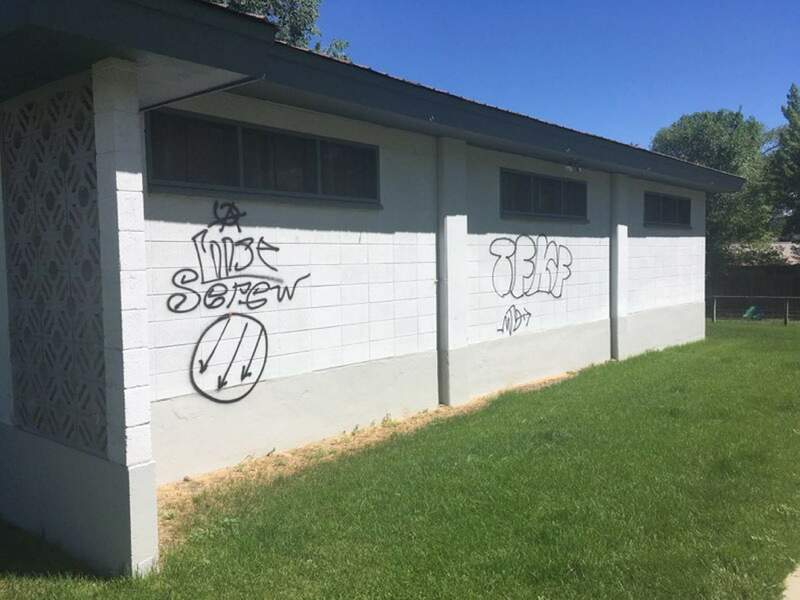 They received the first report of graffiti on the west side of the swinging bridge near Animas Crossing at 8:14 a.m. Another report came in at 8:47 a.m. from the Church of Christ at 247 West 21st St. Additional graffiti was found on the back of the Durango Martial Arts Academy building, 1129 Camino del Rio. All three of the works feature three arrows surrounded by a circle. Police are investigating the crimes but don’t have any leads. The graffiti on the swinging bridge was removed by the city’s Parks and Recreation Department. A church spokesperson said a maintenance worker will clean off its building. Most graffiti can be painted over relatively easy, said Steve Barkley, a code enforcement officer for the city. A graffiti remover can be purchased from most paint stores if necessary. When graffiti is painted on street signs, the city has to replace entire signs, as removal will take off lettering on the sign as well. If damages are under $500, a culprit would be charged in municipal court for malicious injury to property, which can result in a fine of up to $2,650 and up to a year in jail, said DPD Cmdr. Jacob Dunlap. If damages to the property are over $500, they face a criminal mischief charge in county court, which can result in higher fines. Catching the culprit can be difficult, however. Surveillance cameras can be helpful, but it can be difficult to determine a person’s identity, as most graffiti incidents occur at night. The department uses random night patrols in high-activity areas in an effort to combat the crime.